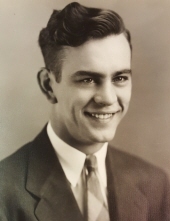 Nicholas J. Kunz, 96, of Bellville passed away January 28, 2019 at Knox Community Hospital. Nicholas was born June 8, 1922 in Mansfield. He served in the United States Navy during World War II as a minesweeper. He worked as a machinist for Peabody Barnes. Survivors include a son Nicholas H. (Ginger) Kunz; grandchildren Tyler and Allison Kunz, Sara and Matt Leedy, Jacob (Cassie) Saxton and Emily Saxton; great-grandchildren Lakoda and Layla. In addition to his parents, he was preceded in death by wife Nita; daughter Nancy Saxton; four sisters; six brothers. Graveside services will be held 10:00am Monday at Bellville Cemetery. Herlihy-Chambers Funeral Home is assisting the family with arrangements. To send flowers or a remembrance gift to the family of Nicholas J. Kunz, please visit our Tribute Store. "Email Address" would like to share the life celebration of Nicholas J. Kunz. Click on the "link" to go to share a favorite memory or leave a condolence message for the family.